The Brazilian state of Mato Grosso (“tall trees”) is named for the majestic Amazonian rainforests that cover its northern sections. Mato Grosso, however, has one of the highest rates of deforestation in Brazil. When I first spoke to Brazilian entrepreneur Luis Laranja, who has dedicated the past eight years to stopping the destruction of the Amazon, I can hear in his voice the reverence for the forest that he is trying to save. I had the opportunity to speak to Laranja because his company, Ouro Verde, is part of the New Ventures initiative at the World Resources Institute. New Ventures works with small and medium enterprises that have positive environmental impacts, and helps grow environmental entrepreneurship in emerging markets. He’s is an ideal example of an entrepreneur using business to enable environmental change. Laranja believes that the Mato Grosso’s Brazil nut trees, combined with the power of small business, can help stop deforestation. A longtime environmental activist, Laranja left his job as a professor eight years ago and moved to the Amazon rainforest to start Ouro Verde, a sustainable Brazil nut company. Ouro Verde buys, processes and sells high-quality Brazil nuts and products, including Brazil nut meal, extra virgin oil, and butter. Laranja’s company is transforming the living rainforest into a source of income for Mato Grosso’s rural residents. “I really believe that what we have to use to preserve the forests is the market,” he says. “If the forest does not provide money for the people, it will be impossible to save it.” Ouro Verde creates special relationships with local indigenous and small-holder farmer communities that collect and supply Brazil nuts. By eliminating the high profit margin “middle man” between the company and local suppliers, Ouro Verde can pay its suppliers fair wages and thus make the living forest more valuable than lumber exploitation or landclearing. (Left: Brazil nut trees produce at their highest levels when they live in healthy, primary forests. Image courtesy of Ouro Verde). Ouro Verde also provides training to those involved in Brazil nut collection to help improve collection, storage, and transportation, ensuring the company receives premium quality and suppliers receive a premium price. Thanks to its practices, the company earned organic certification for its entire product line from Ecocert Brasil, including certificates that address the specific requirements of the Brazilian, European and American markets. The economic value provided by Brazil nut trees also protects the surrounding trees. 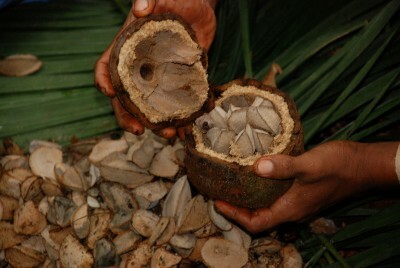 Brazil nut trees produce at their highest levels when they live in healthy, primary forests. Therefore, nut collectors are incentivized to protect entire forests surrounding Brazil nut trees in order to access the largest, best-quality crops. Ouro Verde’s success so far has led the company to explore relationships with new communities and consider expanding its operations to other products, such as the acai berry. It currently cannot fill all of the orders it receives – meaning expansion at some level is necessary. “If I had double the amount of nuts we have today, I would sell them easily,” says Laranja. He currently supplies nuts to large Brazilian chains such as Wal-Mart Brazil, Zaffari and Bunge, but says he frequently receives large order requests from international customers that he cannot accommodate. In order to expand, Ouro Verde needs investment to improve the capacity of its factory and process more raw products. The company has received investment from within Brazil, but is ready to receive additional investment from beyond its home country. Laranja will travel to New York City in April for the New Ventures Global Investor Forum, where he will have the opportunity to present Ouro Verde’s business model to a group of international investors. Ouro Verde estimates that it has already protected 1.3 million hectares of Amazonian forest. Laranja hopes that this number will grow as his company does, proving it can create both environmental benefits and solid profits. “When I first got involved in the environmental movement thirty years ago, everyone thought I was crazy,” he says. “No one had ever heard of sustainable development then. And when I started my company, it was just a crazy idea.” Now, rates of deforestation in Brazil are decreasing each year, aided by the efforts of Brazilian environmental entrepreneurs such as Luis Laranja. Become a Facebook fan of NextBillion and follow us on Twitter.